Using a variety of tools, the clay is sculpted into its proper shape. 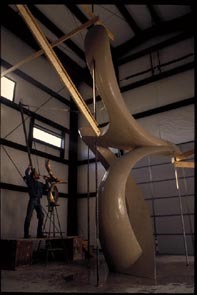 You can see the maquette of the sculpture on a stand on the left side of the photograph. I am using a three-dimensional pantograph that helped to identify where points and edges needed to be on the enlarged clay.